We have two espaliered pear trees – one grows Anjou (the green, chubby and very self-confident variety on the plate above) and the other grows Bartletts (also known as Williams and they are a slender, blushing, more reserved type). So, I picked what we had left and thought I’d share a few great recipes that I love to make with our (surviving) pears this time of year. 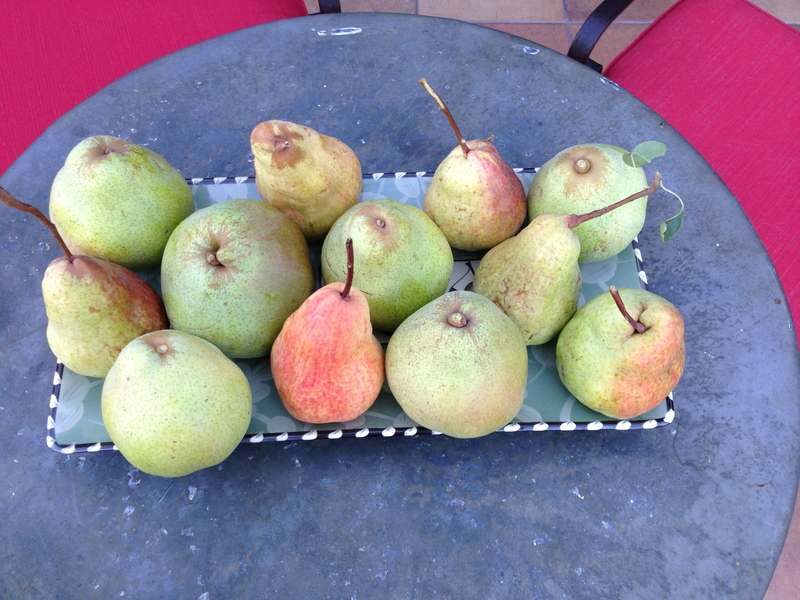 First of all, my dear friend and fellow farm-gal, Gail gave me the recipe for Pear Chutney. I make it every year and my husband just shovels it on to roast pork, or BBQ pork tenderloin. And, because I make pork for Thanksgiving (instead of turkey), it gets gobbled up by family and guests. It also makes a wonderful gift. Bring vinegar and sugar to boil in a large kettle. Add remaining incredients. Lower heat and simmer, uncovered, over very low heat. It will take at least 1 1/2 hours to cook down and the mixture should be thick. Pour into sterilized jars and seal. Store in a cool place. Deborah is a WONDERFUL home chef and incredible gardener who lives in town with her charming husband. They had us over for dinner a while ago and served this pie. It blew my socks off. I’ve made it since and topped it with ice cream. Deborah said she’s made the pie with and without a bag and there was no real difference. I did it without the bag and thought it was great. I’ll give the recipe with the bag, in case you’d like to give it a try. Let me know what you think either way! Combine flour, brown sugar, and cinnamon; cut in butter until mixture is smooth. In a large mixing bowl, combine apples, pears, sugar, flour, nutmeg and cinnamon. Turn into prepared pastry shell. Prepare brown sugar topping and spread over fruit slices. Slide unbaked pie into the paper bag and fold ends over and secure with paper clips. Bake 45 minutes; remove pie from bag and continue to bake 30 minutes longer or until apples are tender OR if you do not use the bag, cover the pie with foil (shiny side down) and bake for an extra 15 minutes. 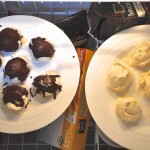 Let me know what you think if you try either recipe. When we first planted our two-acre vineyard, I thought we’d probably get about 5 cases of wine. What did I know? The 2012 vintage is still in barrels, but we expect to get about 400 cases! Here’s a great article that helps explain, on average, how much wine you get per vine! We won’t ever be quite as prolific because we’ve spaced our plants a little farther apart than normal (eight feet from center to center of each plant, and six feet between each row), and they are head pruned, which can improve quality, but lowers yield. I love people who make their clothes into a personal style statement. Especially men. Most guys would look like clowns in this outfit, but this guy pulls it off. How does that happen? Are you watching Breaking Bad? Have you seen Jimmy Fallon’s parody? Here it is. Several nights ago, my hubby was out of town and I heard some sort of otherworldly, horrible scream. The dog went wild, which of course freaked me out. I wound up calling 911, and three officers appeared. I described what I’d heard. They couldn’t find anything. I figured it out. Check out this link and listen to the brief video titled “scream of the red fox.” Yup – that’s what I heard. I feel like an idiot. I LOVE this plan to save unwanted dogs. Claim each pound puppy as a unique breed and build a campaign around the idea, “when you adopt a mutt, you adopt a unique breed.” Change the world. Tell me what you’re baking these days. I love hearing your stories.